branded trolley case and a fast turnaround as standard! 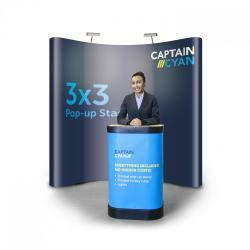 Pop-up display stands are a great way to promote your business at all kinds of events, conferences, shows or exhibitions. 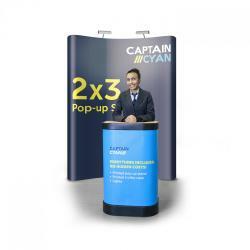 Our pop-up stands come in three sizes, all of which are easily assembled within minutes. Each stand consists of a series of high quality printed panels, printed onto 495 micron scuff-resistant media. The panels quickly attach to the frame with magnetic strips, allowing you to get up and running in no time, whatever the event. 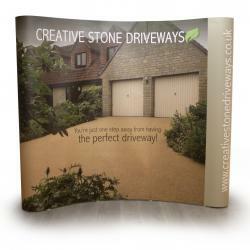 Need a full exhibition stand? Don't see the pop-up display you need? 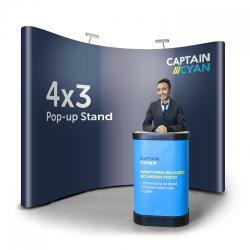 Using our modular popup stand system we can create stands of virtually any configuration – straight pop-up displays, curved pop-up displays, L-shaped, or even wave-shaped! Contact us for a quote. Our competitors commonly have a 5-7 day turnaround for their pop up stands, but we guarantee to have your pop-up stand ready within 48 hours, so you can get it faster. Need help with design for your pop up stand? Our creative graphic design team can help. We just need your company logo, text content and any imagery you'd like to use. Prices start at £60 plus VAT depending on the complexity of your design. Contact us to find out more. Download artwork templates for our pop-up stands here. You can supply your artwork as one large PDF (you might find it easiest to work at 1/4 scale, or as separate pages if you've put your artwork together in InDesign). If you need any help or advice, just contact the Captain Cyan team or use our LiveChat system. We believe that we have the best price around online for this high quality product, with prices starting at just £475 for the entire package or £395 for the stand and graphics only. We're so confident on our prices and quality of product that if you can find the same product, service and quality elsewhere for less, we'll match their price! Just send us a quote you've been sent!